On an ever-widening quest to make things easier for users, JMP has reorganized its library of documentation and offers many new options for JMP 11. The JMP documentation library has grown over the years with the advent of new platforms and increasingly robust options. Some books reached their page-count limit for print, while other books covered a broad assortment of topics. For JMP 11, the documentation is divided into several smaller books. These shorter books provide a more cohesive structure for topics. For instance, information on modeling reliability and analyzing destruction data are in Reliability and Survival Methods. The Consumer Research book covers topics on studying consumer buying habits. Basic Analysis covers the initial types of analyses that you often perform in JMP, such as univariate, bivariate and one-way analyses. Essential Graphing helps you identify the ideal graph for your data, whether you begin with Graph Builder or create bubble plots. Fitting Linear Models focuses on the Fit Model platform and its basic personalities, including the new Mixed Model and Generalized Regression personalities. Specialized Models provides details about modeling techniques such as partitioning, neural networks, nonlinear regression and time series analysis. Profilers covers the family of interactive profiling tools, which enable you to view cross‐sections of any response surface. Quality and Process Methods describes tools for evaluating and improving processes, from Control Chart Builder to attribute gauge charts and measurement systems analysis. Multivariate Methods describes techniques for analyzing several variables simultaneously (for example, studying correlations and analyzing the structure of multivariate data). Reliability and Survival Methods provides details about evaluating and improving reliability in a product or system, and analyzing survival data for people and products. Consumer Research describes methods for studying consumer preferences and using that insight to create better products and services. Scripting Guide provides details for taking advantage of the powerful JMP Scripting Language (JSL). The syntax for functions and their arguments, and the messages that you send to objects and display boxes, are now in JSL Syntax Reference. You'll be able to download the individual PDF files from our website and open them from the JMP Help > Books menu. With the restructured library, we provide two new options in the JMP Help > Books menu to assist you in finding help fast. Book Descriptions contains a general description for each book along with a list of its topics. You can also open each book PDF file from this document instead of hunting through the JMP Help > Books menu. 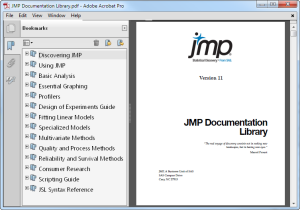 JMP Documentation Library is a large PDF file of all JMP documentation. If you don’t know which book to look in and prefer PDF files over the in-product help, try searching the JMP Documentation Library PDF file. Adobe Acrobat users, I recommend that you use the advanced search feature to show search results in an outline view. Select Edit > Advanced Search and search for the term, and then select from the list of results. As I mentioned in an earlier blog post "JMP help at your fingertips," JMP offered digital books (or e-books) for the first time with the release of JMP 10.0.1. The e-books provide interactive options and let you personalize your reading experience. Change the font, brighten the display, or view content against a black background. Many e-readers let you search the book, a dictionary, Wikipedia and even your annotations. 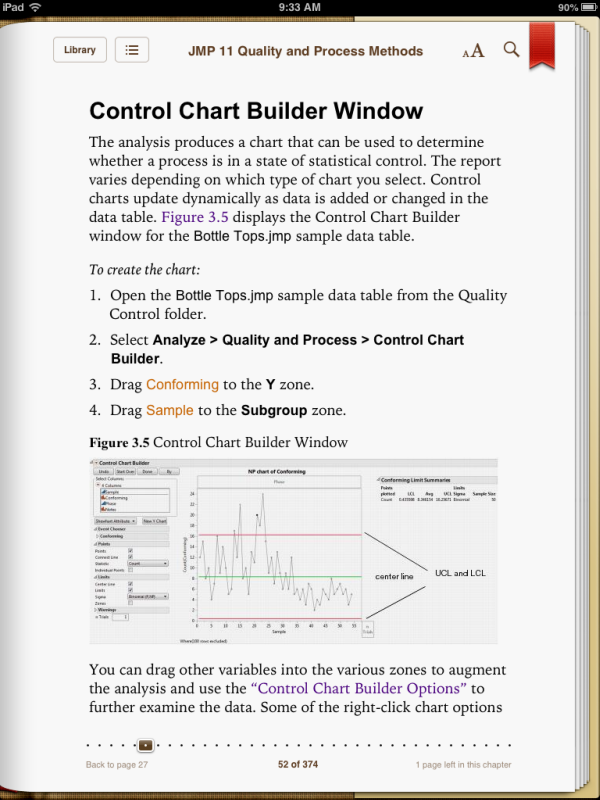 JMP e-books were initially sold only in the iBookstore. For JMP 11, you’ll also find them on Google Play, Amazon.com and Safari Books Online. Curious or perplexed users often search using Google first. 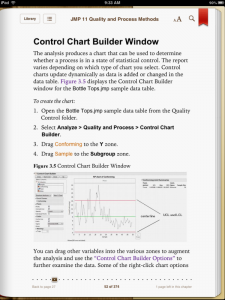 JMP help topics are on JMP.com, so searching for terms such as “attribute gauge chart” or “forecast product reliability” lead you to the JMP help. This is the same help content as in the JMP product but with more statistical details and examples. To avoid wading through Google search results, visit our website and search our help directly. JMP 11 help will be available when JMP 11 is released next month. At the top of any help page, enter terms in the orange Search JMP Online Documentation box. Questions or comments? We want to hear from you. Email JMPDocumentation@jmp.com. Note: This post is part of series of previews of JMP 11 by JMP R&D members and technical experts. The JMP Blog will feature new previews every Tuesday until JMP 11 is released in September. Check out all of the JMP 11 previews.